Posted: Monday, September 10, 2018. 3:08 pm CST. By BBN Staff: The Ministry of National Security made a huge drug bust in northern Belize last night. Twenty six bails, or 486 parcels of suspected cocaine weighing 556.2 kilograms were found in a narco plane. According to a statement released by the Ministry, yesterday its Joint Intelligence Operation Center (JIOC) received news of a suspicious aircraft heading towards Belize. This prompted the Ministry to deploy law enforcement officers into key locations in northern, southern and western Belize. Authorities were in place until around 8:30 p.m. when residents of nearby villages in the Tres Leguas area of Orange Walk reported sights of a low flying aircraft flying in the area. The team of officers deployed north reportedly followed the sighting. 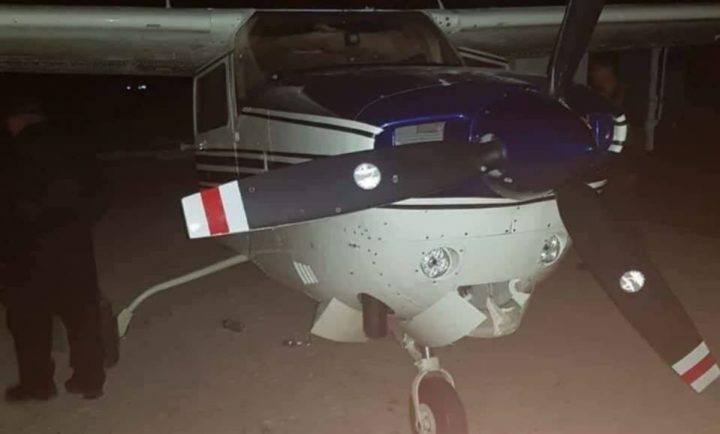 That was when they reached an area where they saw a single-engine Cessna aircraft in the middle of the road with people and vehicles around it. The officers approached the aircraft when they reportedly came under gunfire. They returned fire during which the purported gunmen escaped. However, a search of the aircraft led to the packages. A further search of the immediate area led to the discovery of a Nissan Pickup truck with a Mexican license plate. Also, two Belizean men and to Mexican men were found in the vicinity. The aircraft and vehicles were processed by Scene of Crime technicians. Thereafter the cocaine and detainees were transported to Belize City.